What comes to your mind when you think of Indian art? Indian art conjures up an image of Indian traditional painting styles belonging to different states and cultures. Traditional Indian art covers up a variety of styles of paintings that draw inspirations from religious, cultural and communal factors and yet have something unique about themselves. The origin of traditional Indian art can be traced back to thousands of years and it has evolved a lot in these years in terms of techniques and styles. Indian traditional paintings are usually miniature paintings. This means that they are done on portable and much smaller media such as paper and cloth. It is believed that Pallas of Bengal were the pioneers of miniature paintings in India. But it was not until Mughal era that Indian miniature painting style reached its pinnacle. Mughal style was a unique blend of Persian and Indian style. After the decline of Mughals, the tradition was carried forward by Rajput and other Rajasthan tribes that had their own styles of Indian traditional art. It is a common practice to paint miniatures on perishable medium such as papers. But here are certain Indian traditional art forms that are famous worldwide for using different surfaces such as cloth scrolls, palm leaves etc. The styles also vary from using precious stones and elements such as silver and gold to more basic colors such as the ones extracted from nature. This style of traditional Indian art belongs to the folk tribes of Rajasthan. These paintings are done on scrolls of cloth known as phad instead of paper. The themes of phad paintings are usually religious and they are used by Bhopas, the priest-singers as mobile temples. The size of phad paintings vary from a couple of feet to huge paintings, up to 30 feet long. The colors used to paint phad paintings are also very interesting. They are extracted from vegetables and other natural sources. 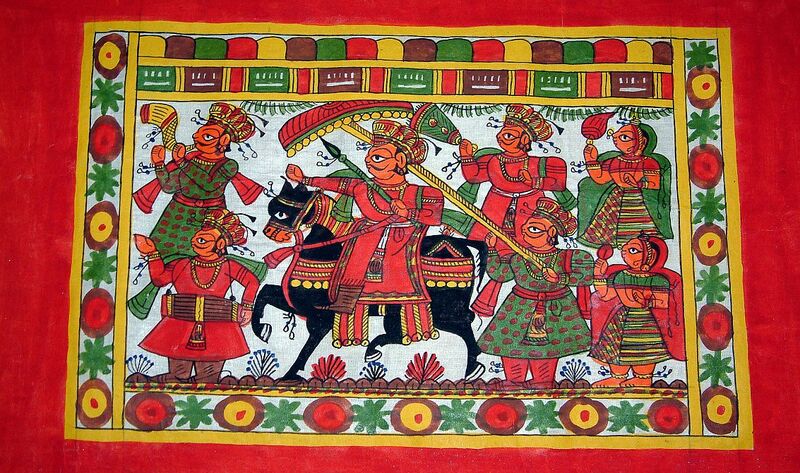 This unique style of Indian traditional paintings is still in practice, mostly in various districts of Rajasthan. Pattachitra literally translates to leaf paintings in Hindi. Originating from Odisha, this style of traditional Indian art is done on palm leaves. Palm leaves are very fragile as compared to canvas and cloth. So the colors that are used need to be viscous enough so that they do not spoil the surface of the leaf. Like other Indian traditional paintings, the theme of pattachitra style is religious and mostly stories of Hindu deities are painted. Pattachitra style is quite famous among both Jagannath and the Vaishnava cult followers. An important thing to observe is that all paintings are given decorative borders. Colors used are natural and extensive use of chalk and charcoal is done as base. Both the styles are very famous forms of South Indian traditional paintings. There are couple of things that are common between these two styles. Firstly, the themes of paintings are religious. They majorly depict the stories of Hindu gods and goddesses, such as episodes from Ramayana and Mahabharata. Secondly, the materials used to paint both of them vary from simple vegetable colors to ivory pellets, stones, gold and silver to decorate them. These paintings are done on wooden frames, cloth, and canvas as well as on paper. The basic outlines and sketches of characters are drawn using charcoal which are filed in using vibrant colors. Once the sketching and painting part is over, paintings are decorated using iron and silver foil work and glass beads. In Hindi Kalamkari translates to “Pen work”. So instead of brushes and other convectional painting tools, this traditional Indian art is done using pen. The more recent trend is to use block-prints. It developed in Andhra Pradesh and later evolved in Golconda sultanate during the Mughal era. This painting style draws huge inspirations from Middle-eastern styles. In India, there are two types of Kalamkari stles in practice. A) Srikalahasti style that involves free hand designs using pens and then filling it with colors. B) Machilipatnam style that is used to make dyed block paintings using vegetable colors. 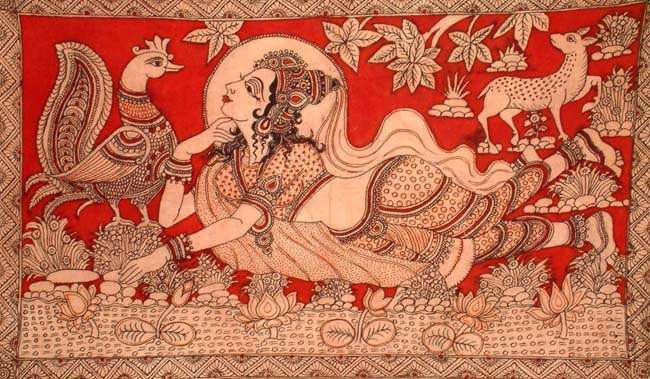 A single Kalamkari painting involves seventeen long steps to complete one work of art. Next article Why You Need Email Server Hosting?